There has been a ton of media coverage speculating on all sorts of Apple products in the pipeline and guesses as to what is coming out this fall. First of all, nobody knows except Apple. All of the pundits are guessing. Even if you are working on the assembly line putting the phone together, you have no real way of knowing when it will launch. Yes, there will be a new iPhone this fall and it may be called the iPhone 6, it may be called the iPhone Air, or it could just be the new iPhone. Screen size: There is speculation that it will have a bigger screen or that there will be 2 different sizes of screen and my guess is that we will not see the larger screen this year. I think that when Apple extended the screen the last time that the change was made for the next 3 - 4 years which means we probably have 2 more years of this form factor. Part of the reason is that people get really upset having to buy new sizes of accessories. Seems silly but it's that kind of thing that ends up annoying people. I am going to go out on a limb and say that there will not be an iWatch introduced this year meaning 2014. The wearables market is already seeing gear from competitors like Samsung, LG, and the much anticipated Moto360. The reviews on these devices basically say "Nice but not great" which tells me that it would be a bad move to introduce a new iWatch because the market is already wondering if these are necessary and launching it so soon after others makes Apple look a bit desperate. Most people assume whatever Apple introduces will be incredible and with the other watches only working with Android, Apple isn't really losing current customers unless those customers switch from iPhone to another phone. That could happen but the numbers won't be significant since people would have to break their contracts and do massive data migration. The only reason I could see to introduce the iWatch in the fall would be if it will have the health / fitness tracker capabilities. Everybody will want one in January as they fight off the holiday pounds and look to get in shape for spring. The Macbook lineup have been excellent over the last few years but with a lot of great Apple products, they look a bit boring after a while. This fall would be a great time to introduce color to the Macbook line. People were willing to pay $200 extra in the past for the black polycarbonate Macbooks and I think that being able to get them in multiple colors would spring a little life into the sales of the product line. Not that Apple needs to sell more as they do well enough but when the competition is cheaper and getting thinner, it would be nice to be able to buy a black Macbook Air to show off some style. With CarPlay launching this summer / fall, there is going to be a lot of visibility on Apple from the support perspective for the in car experience. While it's not a requirement that it launches without any issues, having any problems that become news will be a black eye on their launch into this marketplace. These are the slides from the presentation at Minnebar today. It&apos;s been interesting reading about all these other apps that people are downloading to share "secret" information that is really just gossip for grown ups. The marketplace seems to have a lot of me too apps that are just a copy of something else that just got a Series A round. It feels like the de al site gold rush when Groupon came on the scene. Everything seems to be derivative today and I think that&apos;s good. It&apos;s an evolution from what works for today&apos;s technology to what will work for tomorrow. But I also like to see what is called punctuated equilibrium happen in the marketplace. This is the idea that evolution is very slow or non-existant for a stretch of time and then all of a sudden a change occurs and there is massive change and all is disrupted. The iPhone caused punctuated equilibrium in the phone marketplace. The Internet did this to shopping in the late 90&apos;s and then the market did it to the internet in the early 2000&apos;s.
I don&apos;t think that smart watches are going to be a massive change to the market but they will definitely have an influence. What I do think is going to be the major driver of the future is all the people who are now buying devises connected to the internet that report data back to a cloud database. The challenge will be that, like all the deal sites, these devices are silos of data and the company that allows me to join the databases and make everything communicate easily will earn the money and the market and all others will need to adapt to their way. We are launching our first MVP tonight at the Beta.MN event in downtown Minneapolis. There's going to be about 300 people and we are looking to get feedback on our location based survey startup currently operating under the name "RoomPoll". We have all the startups that are attending loaded with feedback forms as well as the event and the RoomPoll site too. It should be a fun night with a lot of great networking for those interested in Minneapolis startups. If you are there, find the guy with the RoomPoll shirt on and say "Hi!". Especially if you are a developer wanting to help build out this great new startup! 2013 was a busy year. 2014 will be busy too. Where does the time go? For some odd reason, it feels good to "reset" at the beginning of a new year even though it's an arbitrary point in time. I keep saying to myself, "If I can just get through December..."
DSTRB has a few things in the works for 2014. First, we are forming a board of successful business people from a variety of backgrounds to hear pitches from people who have ideas for businesses. Think Shark Tank meets support group! The goal is to provide free advice, direction, and if necessary, funding to help them get their ideas off the ground. We want to help build an environment where people feel comfortable taking calculated risks and reaching for their dream of building and launching a business. Second, we are working on a prototype of a new service that is going to help people understand the world around them and provide a framework for launching multiple businesses based on this new service. We are quite excited about it but will reveal more in a few months. I'm going to miss it. I have all the things I want on one page. And now I'll have to go somewhere else to get it. I think Yahoo has an alternative to it but I'm not thrilled with having to use my yahoo account as I don't really use my Yahoo email or profile. I recognize that Google needs to drive products that drive money and that this specific product probably fell out of favor because nobody wanted to own something that was too difficult to monetize or manage but it was definitely convenient for me. I'm sure when it's gone there will be a few sites that will pop up like when Google killed off Google Reader but this one doesn't seem to be drawing as much attention compared to Reader which is fine. Time for me to figure out a new option. Movie people are getting on board the Netflix original content bandwagon and I think this is the beginning of a major shift in how content is produced or even packaged for consumers. Netflix announced today that it will be bringing 10 episode season one of the series Sense8 to Netflix in late 2014. This marks the first time the Wachowskis, the people behind The Matrix triology, V for Vendetta, and other movies, will work in television. Or does it? Is Netflix really television? The lines between television, movie, internet, and even mobile are starting to get blurred to the point that it really doesn't matter anymore. You can watch a movie on your cell phone and then switch to your TV when you get home. So is that television or mobile or does it matter? If you are Nielson, it matters. If you are Comcast, it matters. But if you are the consumer, it doesn't matter. With House of Cards and Sense8 going directly to Netflix, it confuses the definition. I've never watch the television series Louis "live" on FX but I've watched it via Netflix on my AppleTV on my television. And when I watched it, i've watched a few episodes in a row. But what is an episode? 30 minutes or really 22 minutes due to time for commercials? 60 minutes or whatever it is with commercials? If you consider that a television season is 12 episodes at 22 minutes each, you are really talking about a little more than 4 and a half hours of content. But what if you started to take away the conventions of the standard television show and time constraints and gave the creator control over time? Maybe some seasons will be 20 episodes while others are 10 but with longer segments. Would ABC's Lost series been scripted differently? Would we get better story telling and character development? Could you do different character arcs or even although the view to pursue their own development? Netflix knows something we don't which is what everybody is watching and what everybody wants. They are potentially the Google of visual media. Remember when Google filed their IPO and it seemed very risky? I think television and movies will be changing a lot over the next 5 years and we'll remember how television is today the same way we remember television before there were DVRs. Google Reader is gone. Accept it. There's been a lot of people upset that Google Reader is being shut down. You can read a summary of the anger over at TechCrunch. Many people are asking Google to bring it back and even posting online petitions to plead Google to keep Google Reader alive. I feel that it's time for us to move forward. Accept it. Google is a grown up company and can do what it wants. Google is doing something that few companies rarely do which is getting rid of products that, while popular, don't fit in with their strategy or direction of business anymore. 7 years of use from a product in this day and age is actually a long time. There has been an incredible shift over the last 7 years in both consumer products and software. 7 years ago, we didn't have Twitter. 7 years ago, we didn't have an iPhone. Amazon's Kindle didn't exist. Evernote didn't exist. You couldn't buy a Mac with an Intel chip inside. The first gen iPod Shuffle had just come out. Analytics is being applied to every part of our life from fitness (Fitbit, Nike Plus) to home automation (SmartThings) or even finance (Mint). While some cars have had the ability to display some statistics about how you are driving, it's always been an expense option to add as part of a package. This will change when Automatic goes live. 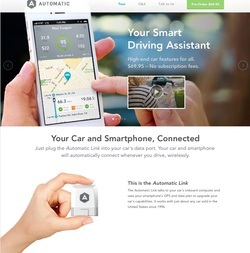 Automatic connects your car to your smartphone to give you high-end car features such as driving feedback, trip timelines, and check engine light codes to diagnose what is wrong with your car. It can also tell you where you parked and in beta is a Crash Alert to call 911 if you get in an accident. And all it costs is a one-time purchase of a car plug for $69.95. There is no subscription to buy. I can already tell that this would save me money because anytime the check engine light goes on, my local garage charges me $99 to read the code and "diagnose" what the potential problem may be with my car. Other cost savings would come from the driving feedback and the trip timeline. And that's just for the individual user. Parents would love this device to keep track of their kids and their driving habits. You can imagine a small business using this to both track and manage their drivers and to compensate them for their miles and to make sure their fleet of cars are being driven according to company guidelines. And if a driver ever gets into an accident, you would have some information regarding hard breaking or speeding which might even help should you have to go to court. The idea of this has been around for a while but it's nice to see that somebody has taken this "to the masses" and to show the big automakers that technology like this is possible and doesn't cost $500 with a monthly subscription. iPhone users can pre-order now for May shipping, Android ships this fall.